Gasteria maculata is just one of approximately 70 species of ornamental perennials from the family Asphodeloideae. This group of small succulents are clump-forming, almost stemless and display their tough glossy leaves usually in two ranks. They produce 'flame' coloured tubular flowers 1 inch long, and usually wider at the base, and rare carried on 12 inch long arching stem. As gasterias are usually grown as houseplants, their flowers can be produced at anytime during the growing period. Gasteria maculata is a native to South Africa. It can grow to a height of inches while each leaves can reach a length of at least 8 inches and are tipped with a horny spine. The leaves them selves are dark green and heavily flecked with white blotches and striations. Gasteria are not what you would classify as hardy plants, and while they would need a minimum temperature of no less than 5 degrees Celsius they can be perfectly happy left outside over the summer period from June onwards. Just make sure they are hardened off for a couple of weeks before leaving them out in the full sun otherwise they can easily scorch. Also, avoid getting the leaves wet when watering as this can cause rather unsightly scorch marks under direct sun. Gasteria really only put on growth during the summer period, and during this time they can be watered freely - so long as they have potted on into well-drained compost such as John Innes 'No 2'. Position them in as sunny position as possible although they can tolerate a certain amount of shade if necessary. 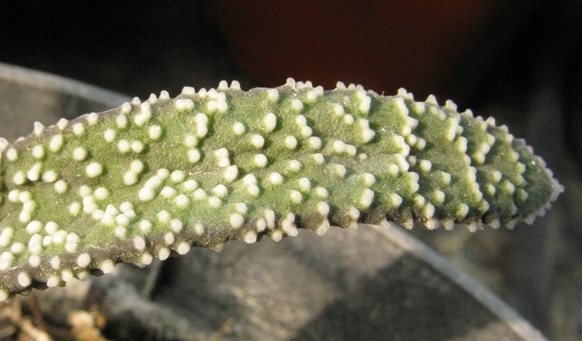 During the winter months, gasteria species will need to be kept on the dry side. However, if they are being kept in a warm room then a more regular regime may be required to prevent the leaves from shrivelling. Gasteria can be raised from seed in the spring , but this family hybridises easily. 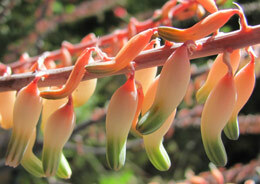 Which gave me a slight problem when it came to identifying my own gasteria - see main photo. It didn't help that when I purchased it, it was incorrectly labelled as Gasteria verrucosa! Secondly, researching which Gasteria species I do possess pointed to Gasteria maculata, but the leaves for this species only grow to 8 inches and my specimen is already pushing past 9 inches and it has another season of growth next year. So this means that it could in fact be a hybrid, but for now G. maculata will do.